The Steinstossen is a centuries-old Swiss stone throwing contest. 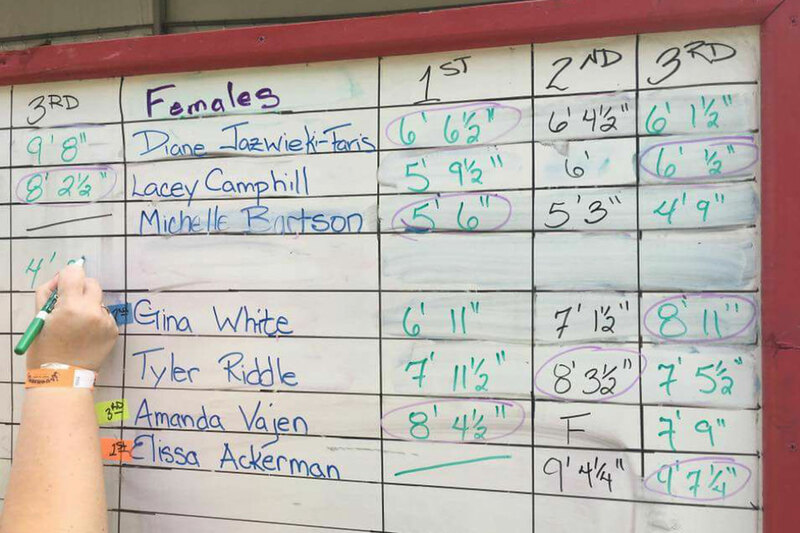 In this competition, men and women will throw large stones (138 pounds and 75 pounds, respectively) into a designated sand pit and the winner will be the one throwing his or her stone the longest distance. Prizes will be awarded for 1st, 2nd and 3rd places, in both mens and womens categories. Entry in this event is free and open to the public, but a release must be signed during registration to participate. Steinstossen (stone throwing) is a typical Swiss Alpine sport that is a leading attraction at festivals in Switzerland, but is seldom seen at festivals in the United States. The Ohio Swiss Festival in Sugarcreek has the distinction of the longest running competition, being run annually since 1956. Steinstossen at the German-American Festival began in 1989. Contestants in the Steinstossen hurl a huge stone (weighing 138 lbs for men and 75 lbs for women) in three heats, beginning at 3:00 pm on Saturday and Sunday. Contestants begin on a 20 foot runway, hurling the rock into a 4 inch deep sand pit. The winners at each session win prizes. Practiced among the alpine population since prehistoric times, it is recorded to have taken place in Basel in the 13th century. During the 15th century, it is frequently recorded to have been practiced alongside the Schützenfeste (shooting festivals) of the Old Swiss Confederacy. It is also central to the Unspunnenfest near Interlaken, first held in 1805, with its symbol the 167 pound Unspunnenstein. In 1860, Steinstossen was introduced as a track-and-field discipline in Germany, retaining the name in spite of the stone being replaced by a 15 kg block of iron. Stones used at festivals in Switzerland are of varying sizes and weights, but usually are not much over 100 pounds. The largest stone used is the famed Unspunnen stone weighing 184 pounds. For 21-years, the United States record holder was Jud Logan of North Canton, Ohio with a throw of 14 feet, 4 inches set at the Sugarcreek event. 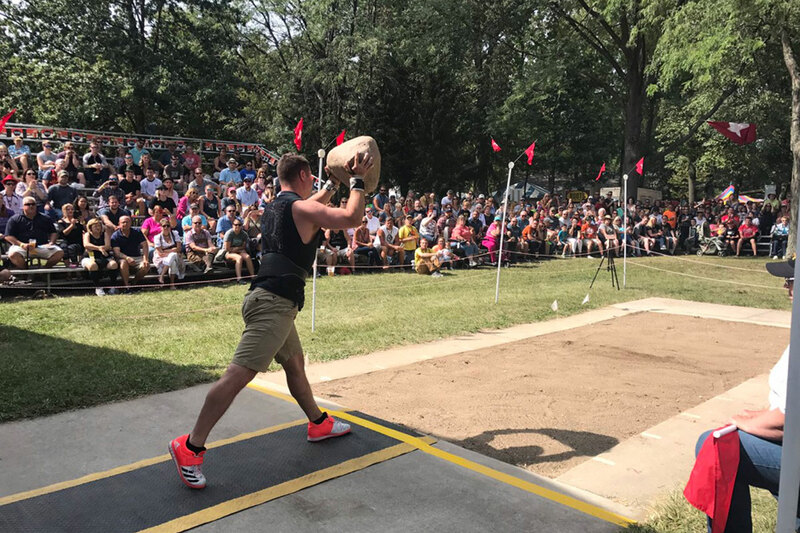 That record was broken by Kevin Marx of Toledo in 2009 with a throw of 15 feet, 3½ inches at the German-American Festival. There is also a women’s division of the Steinstossen, using a 75 pound stone. The Ohio women’s record, set at the German-American Festival in 2007 by Becky Ball is 12 feet, 11 inches. 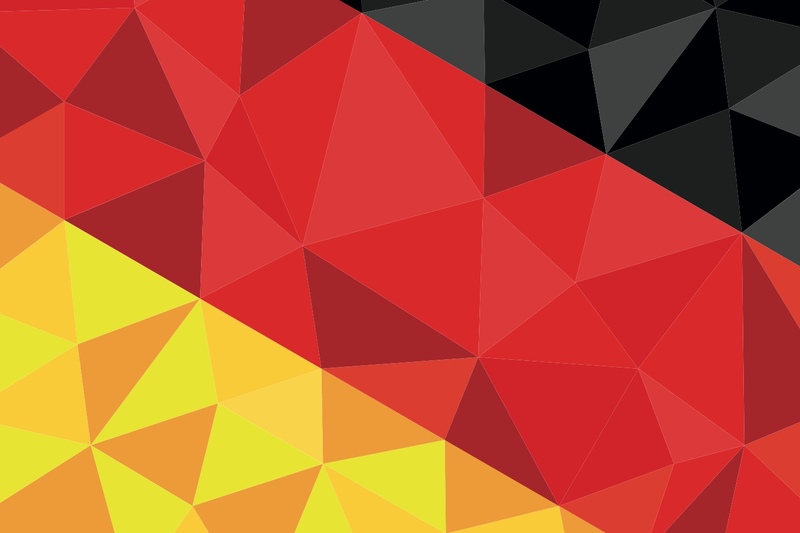 The competition, staged in front of hundreds of avid fans, is scheduled for a two-hour period beginning at 3:00 PM on Saturday and Sunday at the annual German-American Festival.